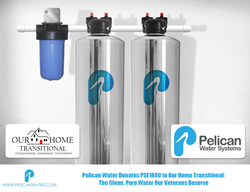 Pelican Water recently donated a combination whole house water filter and softener to Our Home Transitional, a resource and assistance organization that serves homeless, single female veterans in Flint, MI. Pelican Water Systems is pleased to announce its recent donation of a PSE1800 whole house water filter and salt-free softener system to Our Home Transitional. Founded by Carrie Miller, Our Home Transitional is a charitable resource and assistance service for homeless single female veterans based in Michigan. The Pelican Water combination whole house water filter and salt-free softener will provide cleaner, safer water for the organization’s recently purchased home in Flint, MI. The Pelican PSE1800 includes a whole house filter whose carbon filtration system will protect the Our Home Transitional families by removing significant amounts of contaminants and chemicals from the home’s water. The families will be able to enjoy high-quality drinking water from every tap in the house as well as shower water free of the drying effects of chlorine and chemicals. The system also includes a Pelican NaturSoft Water Softener that will protect the home’s appliances and plumbing as it prevents hard water scale build-up. Pelican Water hopes that by enjoying cleaner, safer, better tasting water in the home, the veterans and families of Our Home Transitional will be one step closer to getting back on their feet and achieving their dreams. Pelican Water offers a wide range of affordable and environmentally friendly water treatment products, including salt-based and salt-free water softeners, UV disinfection systems, and sediment filters. Since 2007, Pelican Water has provided leading customer service, competitive pricing, and water filtration systems that are low-maintenance but highly effective. The company belongs to the U.S. Green Building Council, The Water Quality Association, and has an A+ rating with the Better Business Bureau. Pelican Water Systems is determined to provide the best eco-friendly solutions to address common water problems without compromising performance. To learn more about Pelican Water and its products, please visit http://www.pelicanwater.com.